Sometimes one’s fashion sewing has to take a little break to make way for other sewing projects – of the less complicated sort. 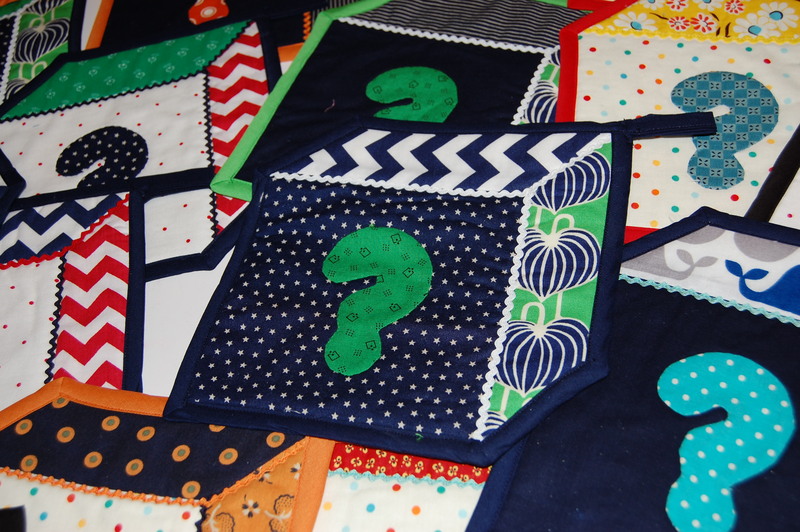 Much of my sewing time the last couple of weeks has been dedicated towards getting some baby gifts ready – and making favors for the guests of a baby shower which I hosted just last weekend. I had seen a Noodlehead blog post for a very cute “baby basket” months ago and had even purchased the pattern (a download, very reasonably priced and, even better, instantly delivered). I thought it might be a cute way to package gifts for all the very deserving moms of my acquaintance and their babies who seem to be arriving quite frequently. 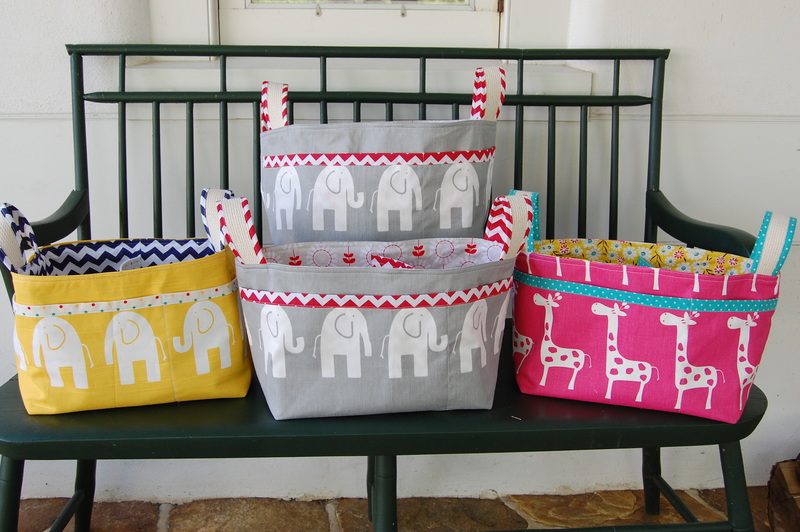 What I really like about this pattern is that the basket is the perfect size for storing diapers and other baby supplies, and then it becomes the perfect size for toddlers to load up with their treasures as they become mobile – as in walking! A picture of one of the Noodlehead baskets in the pattern instructions. 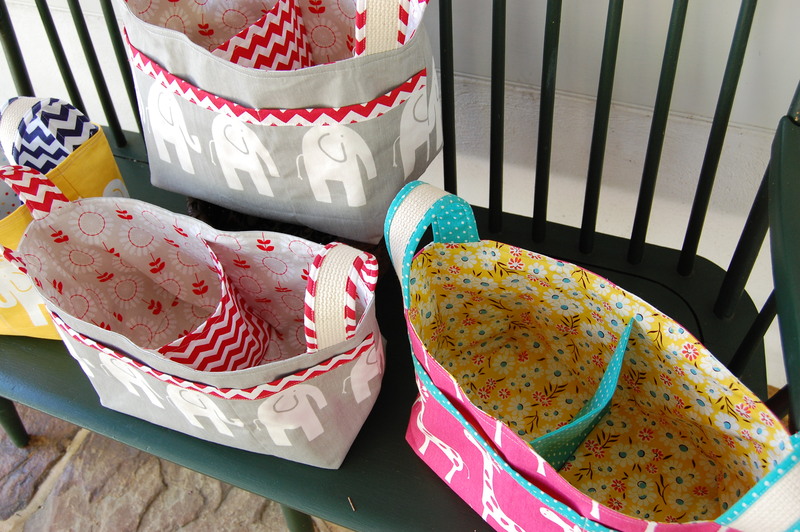 I found myself inspired by some very cute home decorator fabric which I found on Fabric.com – heavy enough to give these baskets some heft, but still soft and manageable. The pattern calls for fusible interfacing – which I never use for my fashion sewing – but which works beautifully in this application – specifically in the body of the bag and in the divider inside. The directions are quite clear, but I found that using a walking foot made the sewing much easier and more precise, especially on the handles and the top-stitching around the top of the bag. 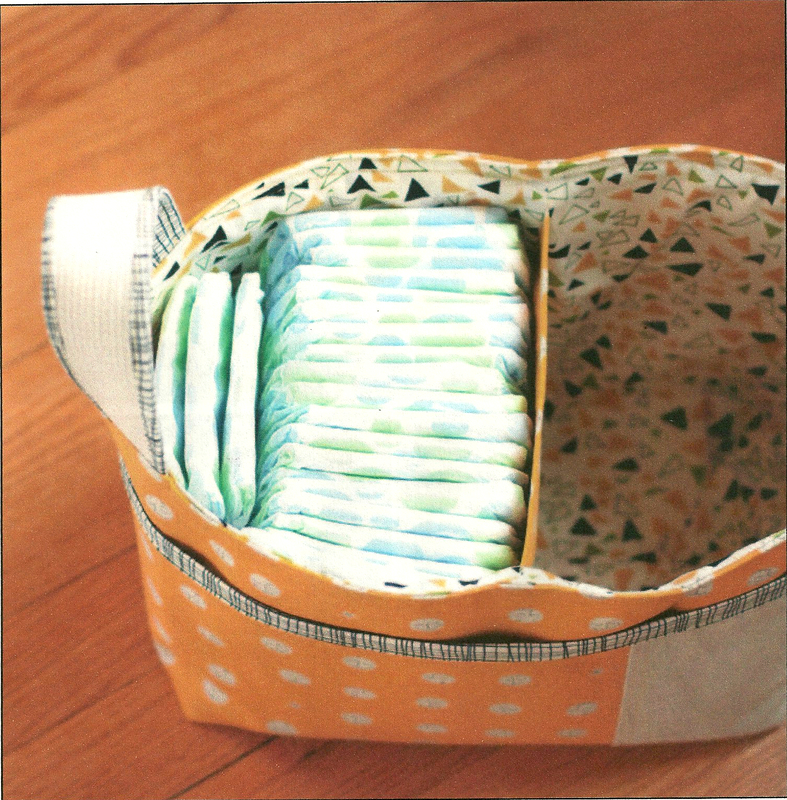 Looking inside of the totes. The front pocket is optional, but I think it adds a useful touch! Of course, I made one for my daughter/granddaughter, and I gave them their choice (although I knew the yellow bag would be the one!) I made the pink one for the lovely and talented honoree of the Shower, and I made one of the gray ones for the new baby daughter of another dear young couple adding to their growing family. 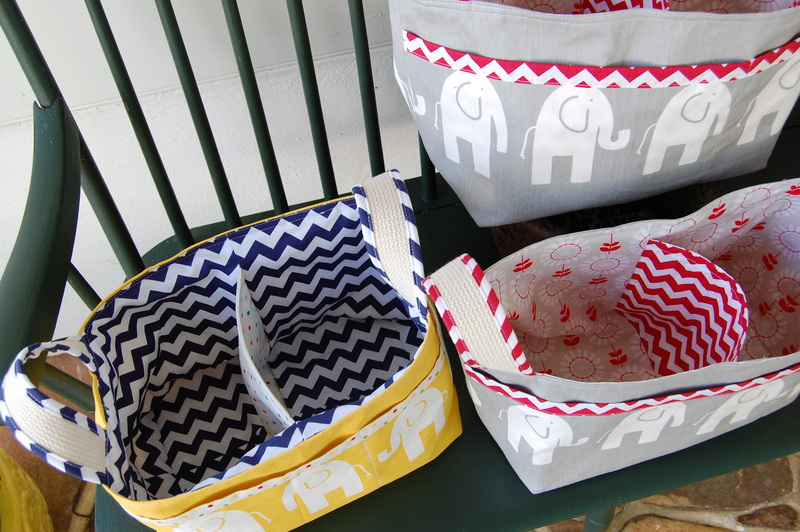 I am keeping the other gray one in reserve in case I need a quick gift sometime, and I know I’ll be making more of these fun and useful baskets in the months to come. Once I had finished the baskets, I turned my attention to making favors for the guests of the Baby Shower for dear Jess. 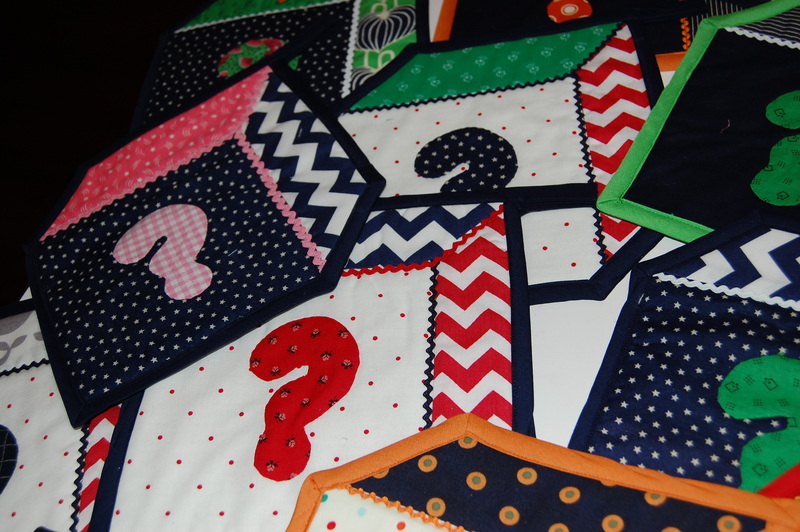 I am kind of partial to making potholders, as I know that everyone uses them, even if just for a microwave. 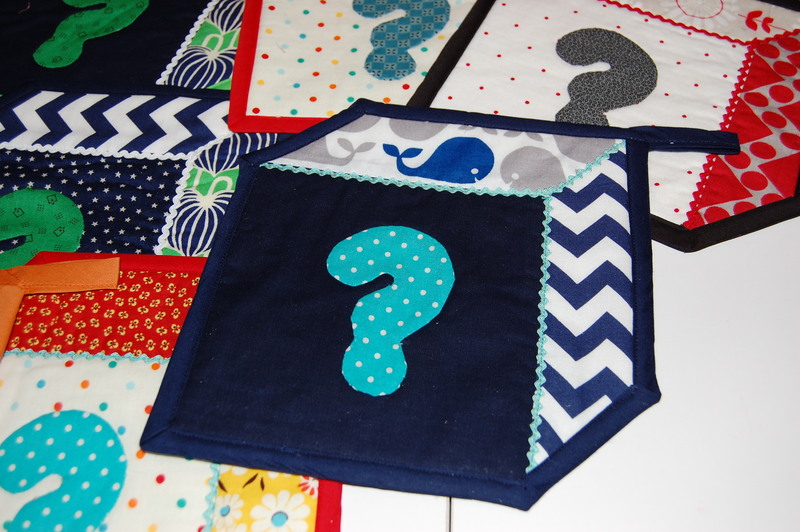 So I designed one in the shape of a baby block, and decided to put a big question mark (?) in the field where a letter or shape would be. 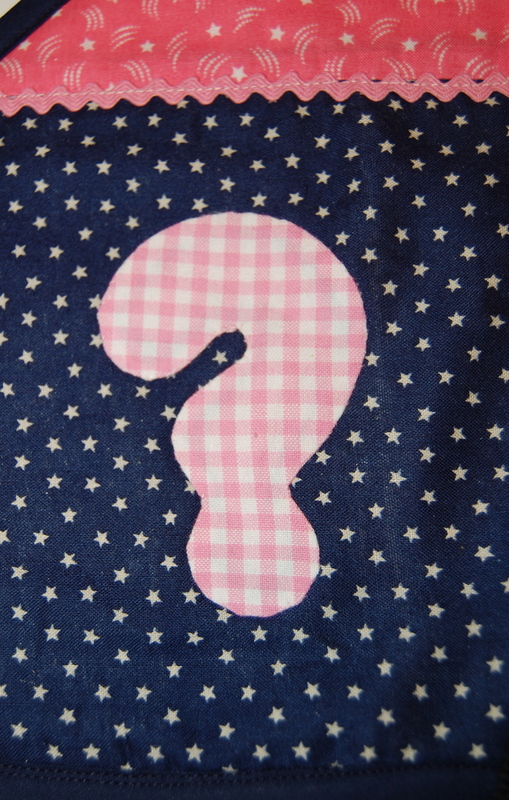 One example of the question mark. Truly, I can be away from fashion sewing for just so long – and I was ever so anxious to get back in my sewing room yesterday to continue work on my current linen “dress–in-process”. The biggest question mark I have facing me right now is: “How long will this one take to complete?” Oh, but how enjoyable the process is! Fashion sewing has it all. 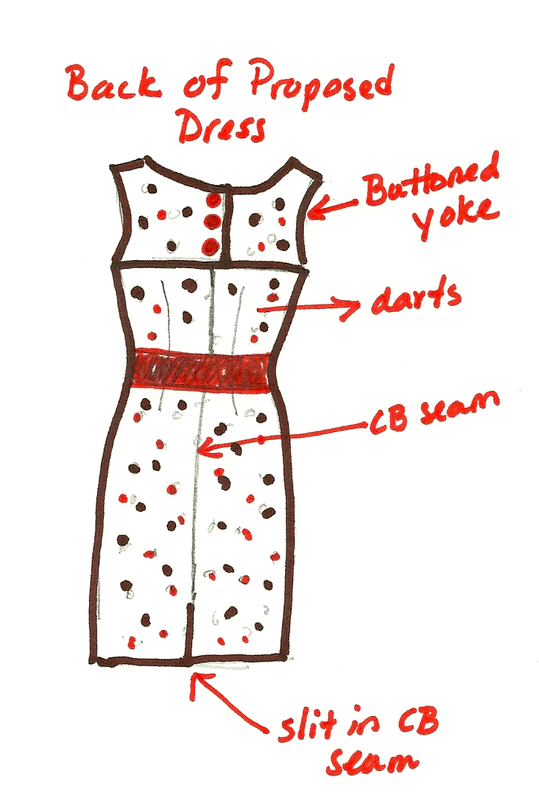 Even the making of a simple dress has some or all of these aspects inherent in its construction: color theory, proper fabric selection, proportion and fitting, pattern manipulation and engineering, technical know-how, style sense, intrigue. Intrigue? Yes – Intrigue. I have done it again. I have my heart set on a making a certain style in a certain fabric, and I don’t have very much of that fabric with which to work. 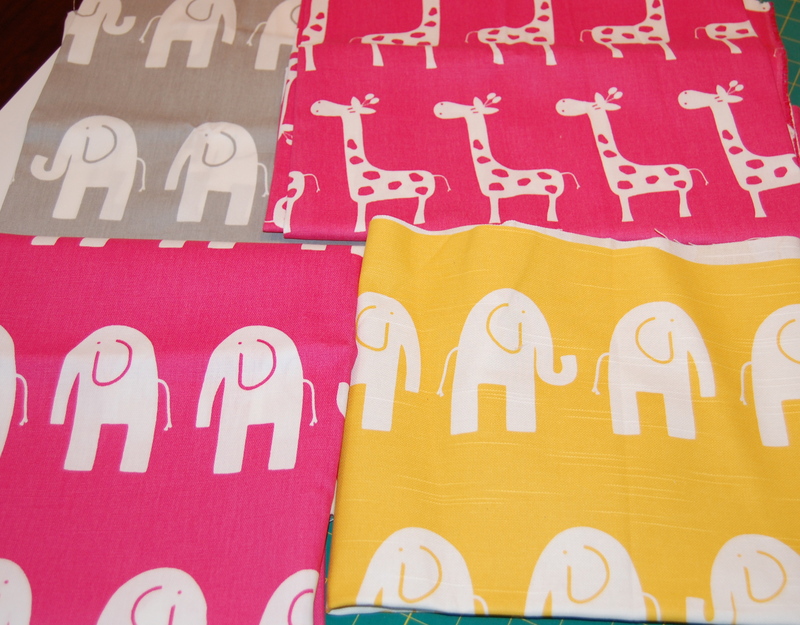 Freshly laundered, this linen looks and feels like new! 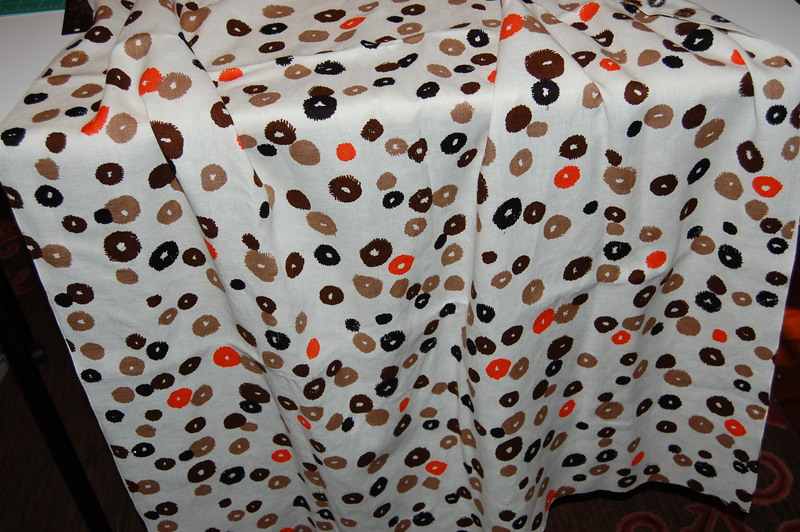 When I first saw it, I immediately thought it would make a cute pair of pants, even though I don’t wear a lot of brown. But I was really drawn to the little explosions of orange scattered throughout the yardage. Actually I should qualify that by saying “scant” yardage. This was only a piece of fabric 1 and 5/8 yards long, which sounds reasonable until the width of the fabric is figured into the equation. At 35” wide, this was not a lot of fabric. Nevertheless, I certainly figured I could get a slim pair of simple pants out of it. That was my intent until I finished my polka-dotted sheath dress just recently. Cool linen dresses and Summer just seem to go together, and suddenly I decided I did not want a pair of pants – I wanted another sleeveless dress. 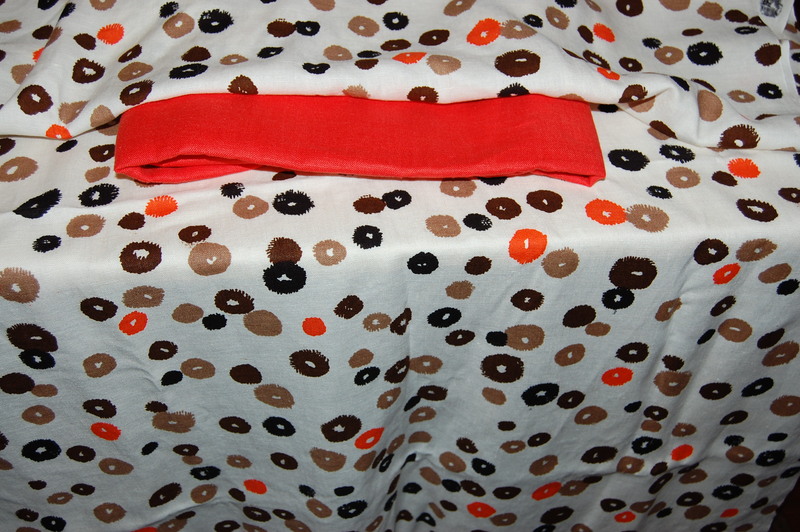 This was partly determined by the fact that I have a piece of new orange linen I picked up a couple of years ago from Britex Fabrics, and the thought of pairing this funky, stylized-dot fabric with an orange belt made out of that linen sealed the deal for me in my enthusiastic wardrobe dreams. Then reality hit. How was I going to manage to squeak a sheath dress out of the amount of fabric in hand? After eyeballing the stretched out fabric, with my sheath dress pattern pieces arranged casually on top, it did not take long for me to know that, NO, this would not work. I would have to figure something else out, but I wasn’t giving up on the dress idea. The only solution was to get more creative. I have always loved subtle “back” details on dresses, such as unusual closures, V-necklines above a back zippered opening, an embellishment of some sort, that type of thing. And I suddenly realized that if I could section the back pieces (only) of my sheath pattern so that I would have an upper back yoke, then I could probably fit everything on the fabric (knowing it would still be a squeeze, however). Now I got really excited. One of my favorite patterns (from 1957) features a back- buttoned yoke, which is seamed right above the shaping darts in the back body of the dress. I figured this is exactly the spot where I would need to section the back of the dress to make it fit on my fabric. The yoke on this dress is obviously part of the kimono sleeve section, but I like the idea of a three-buttoned yoke. This card of buttons cost 2 cents originally! They seem to mimic the small orange explosions on the dress fabric. I have spread out my current working sheath dress muslin a couple of times to determine the viability of my plan. I really think it will work. I am prepared to use narrower seam allowances than I usually like, and I may have to face the hem. This is how I envision the back of my proposed dress. But – first things first. Initially I will be making a new muslin, with the altered and sectioned back pieces. 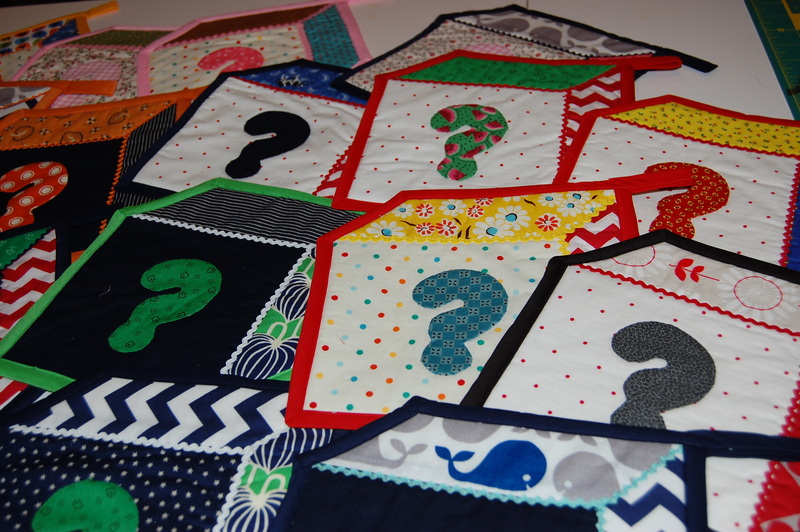 I am sure my enthusiasm for this idea will keep me focused, and in this case, reality may have sewn the seeds for a much more creative outcome than I originally envisioned!